Looking SW from near N end of rubble mound across NE corner of kitchen towards SW corner of farmyard (just behind tree). 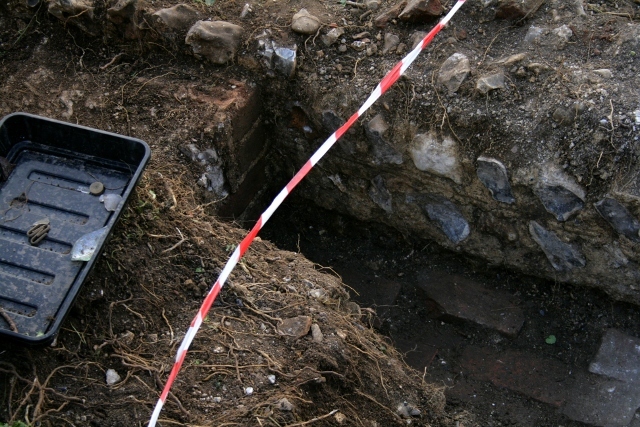 Friday’s dig opened a new 2x2m grid square over the back of the ‘woodstore’ on the east side of the north frontage of the house, as well as over a structure shown on a plan as being immediately beyond it, either adjacent to, or part of, the south-east side of the kitchen/scullery. We also cleaned up the last part of the demolition fill in the bottom of the ‘woodstore’ left over from last Sunday’s dig. It was hard work getting through the thick mat of nettle and bramble roots, as well as its covering of demolition rubble. 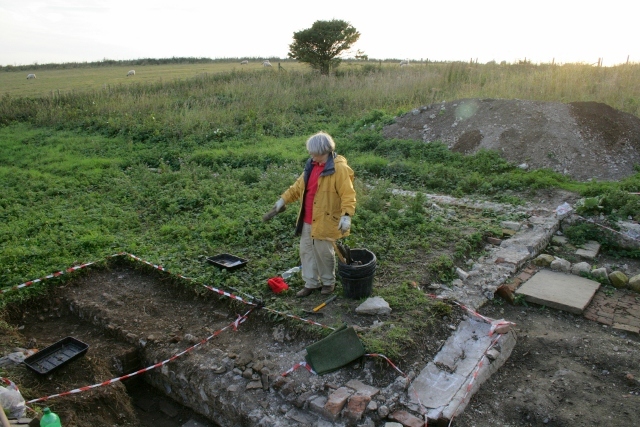 But by the end of the day we had excavated the western half of the trench. Looking SW at the SW end of the ‘woodstore’ and the outer face of the kitchen/scullery wall. Looking S at SW end of ‘woodstore’. 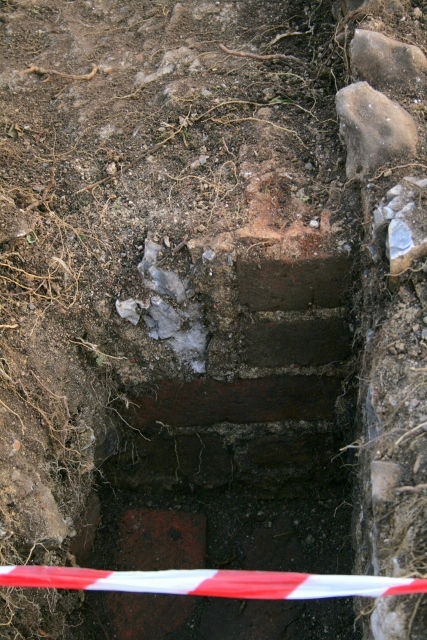 Four courses of the brick and flint wall at the back of the woodstore were uncovered. Plan of dig site, with new dig area outlined in thick dashed green lines. Base plan from ESRO. Its location was more or less as according to the plan which we have. 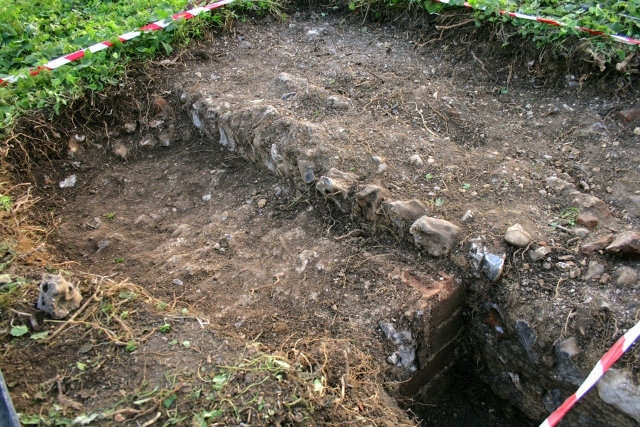 To its south though, the structure shown to be adjacent to the southern half of the kitchen/scullery and the back wall of the woodstore still remains a mystery. We found part of a slightly uneven concrete slab, with embedded flints, at a level midway between the levels of the bulldozer cut kitchen wall (its floor had been completely cut through on this side of the building) and the woodstore’s floor. It clearly butted onto the kitchen wall, and appeared to be contiguous with the pointing on top of the highest surviving course of the woodstore’s wall. Was it the foundations for a chimney against the outside of the house? The surviving remains of a backdoor porch? Or the foundations for a kitchen cupboard? Finds were mostly from immediately above the floor of the woodshed. A nice shiny metal object, not often associated with archaeological digs, turned out to be a piston rod! Ceramics included a large number of beautifully decorated cup and saucer shards with a house and garden design; it was labelled as ‘Foreign’! Glass finds included the inevitable milk bottle shards, and an entire beautifully moulded clear glass button. Interesting was the complete absence of the pink glass (oil lampshade?) shards which normally turn up in large quantities. 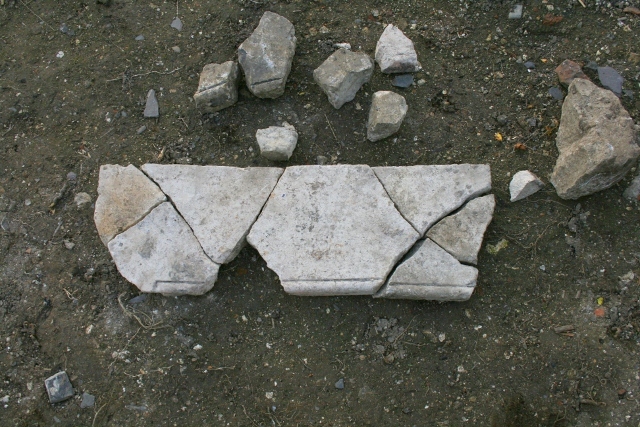 Fragments of sandstone masonry found in demolition fill in ‘woodstore’. Last week we found most of these shards of sandstone masonry. Since then we found a few more fragments from the ‘woodstore’, including one with the groove turning towards the ‘front’ edge. The separate shards in the top of the picture are of a slightly thicker stone. A nice ceramic stoneware find was that of a moulded fragment of a chimney pot, complete with soot on its inner face. Sunday we hope to finish off the rest of this grid square, with the particular aim of finding the east and south ends of our enigmatic feature. They are expected to be just within, or very close to the edges of this square. 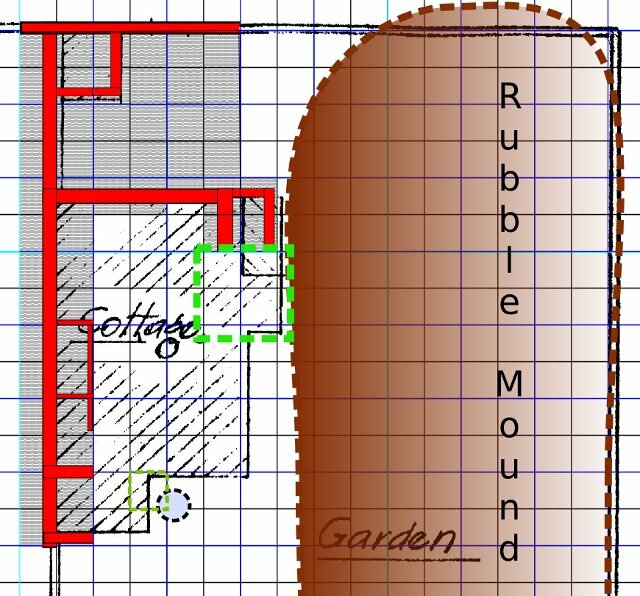 Next week it is hoped we will return to the south side of the house to find the eastern extent of ‘conservatory’ and – most excitingly after the failure to find one to the north of the site – the possible location of the Phipps family’s well!